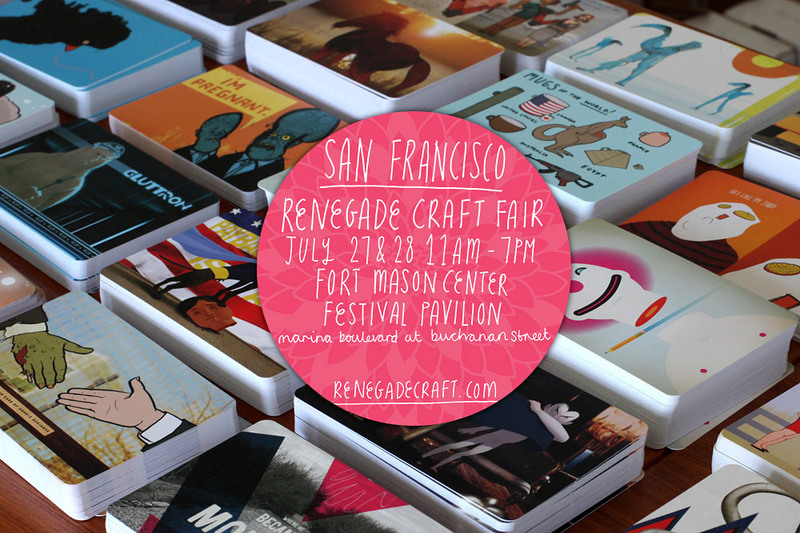 Over the weekend, I displayed my lineup of forty-eight Dordle Cards at the Summer San Francisco Renegade Craft Fair. Dordle Cards at the Renegade Craft Fair. Despite the simple setup, it still involved a lot of work: application, renting a table, obtaining a temporary seller’s permit, making a custom table cloth, building twelve trays, getting change in small bills, hauling all the stuff there, setting up, striking, and hauling it all back. J designed the trays with a few prototypes, and we assembled most of them the weekend before the fair. All it took was a few large sheets of chipboard, fresh X-Acto blades, and some horse-based glue. The table cloth was entirely made by J. The white cloth letters were based on my Dordle font, and applied with adhesive backing. The table, all set up at home. On Saturday morning, my table was set up and ready to go an hour before the doors opened, so I wandered around the massive pavilion to what other people were selling. The atmosphere was bustling and festive. My postcards were a unique item in both price and content. Competitive cards were either silkscreened or letter-pressed, and their preciousness matched a higher price. The cards setup at the booth. A former coworker from Portland selling mustache wax and related goods. Crowds arrived quickly and peaked around lunch. An oddly placed food vendor was next to our booth, and the free samples he passed out caused a frenzy by my booth mate’s table. Prime time at the fair. Oh crap, who is manning my booth! Some people browsing my cards. I wish I had gotten more photos this way. He was in a bitter mood, thinking that people were missing our booth due to the flow of people around the mass of snack samplers. But lots of people stopped to take a look at my cards. The more funny or eye-catching designs faced the main walkway, and almost all the people that saw them stepped in to look at the rest. My pricing was reasonable: a buck a card, four bucks for five cards, and eight bucks for ten cards. On the first day, my pricing sign didn’t mention the five card deal, so I had to verbally tell people about it. On Sunday, I had had drawn pricing signs that mentioned the five card deal. Despite losing one sign, I sold more packs of five. No one sprung for the forty-eight card set. My Dordle Cards made a lot of people laugh. The best moments were people picking up cards to show their friends. I enjoyed it even more when the friends laughed too. I ticked off the cards people bought as best as I could, but my tallies were too imprecise to make a chart. But there were clear favorites. Not every laugh equalled a sale, but many did. I averaged one card every two minutes the doors were open. It was enough to cover expenses and get a little spending cash, but not a living wage for sixteen hours plus hours of my time. I had never seen strangers’ reactions in person, and that alone made all the hassle worth it. Maybe I’ll try going back for winter.